Providing Pet Food Assistance to help limit the surrender process of animals so they may stay in the home they already have; educate our fellow humans on being a proper pet parents; and understanding to respect all the life we share this planet with. Raffle Rescue is an in-home rescue program. Many pet owners find themselves unable to handle the needs of their pets and ultimately set the animals loose to roam or take them to a local shelter. Sadly in too many cases the animal’s life ends in euthanasia. 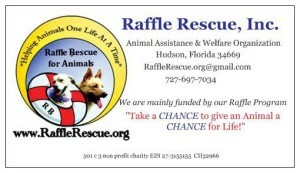 Pet Food Assistance: Raffle Rescue, Inc began in 2009 after reading a local Florida newspaper that Fido and Feefee join the bread lines. Soon after Founder, Lisa Bekiaris began to have family and friends make phone calls to shelters/organizations around the US and found that no one really concentrated on helping people feed their animal family members. The idea began to start pet food drives in Lisa’s community where animals were being surrendered just for this reason. From the very beginning Lisa has seen this need, especially with our senior population. Many that she knew personally, had been feeding their animals their own food, and many times doing without food themselves. She brought this to the attention of the local Meals on Wheels program who was grateful to have the organization help their clients with pets too. Raffle Rescue also provides pet food vouchers to the local Volunteer Way and many surrounding church food banks. Like most organizations, they need funding to help support what they do, Lisa came up with the idea, if you are willing to donate, you may as well be able to win something for your kind offering. So Lisa came up with a raffle program – it’s truly a win win situation for all – as a donor you have a chance to win a great prize, you are supporting the mission of what we do, but mostly it benefits our animal friends. Her slogan: “Take a CHANCE to Give Animals a CHANCE for LIFE” says it all. Since we do not receive any type of governmental support or help, we solely rely on our raffle program to assist in our funding efforts, we also host fundraisers rely on our fellow humans for their kind donations who do not wish to participate in our raffle program. Since we are not in control of what we receive as Pet Food donations in specific brands/types, we give out what we get, on occasion we do get request for special needs pets that have diet limitations and we want to meet those needs as best as we can, the donations help greatly in this area of special request. Also our future plans are to establish a Spay/Neuter/Vaccination Clinic for our local community to ensure that our area’s pets are receiving the proper care as well as helping to control our pet population. Many businesses and individuals support the Raffle Rescue Pet Food Assistance program by donating money, food, or whatever it takes to keep the pet healthy and happy in the place where it belongs with your and its home. Welcome to the “NEW WAY TO RESCUE” Directly in the Home! Saving Pets by Keeping them in the Home they already Have! Animals in our world are gifts of life, they are not inanimate objects, treat them with love, kindness and respect.